Job interviews: be proactive and strategic! One of the things which makes NLP so useful is how it provides a means to rationally and systematically analyse a situation - so that we can see what works, and what doesn't work, in any situation. Take job interviews, for example. Being interviewed for a job is a critical moment in your life. Yet many people approach then with lots of hope - and little practical planning… apart from re-reading their VA and rehearsing a few answers. I’m always fascinated by the optimism of people who open new shops in unsuitable locations. You see the dilapidated and shuttered shop front – sitting there ignored for months on end, since the previous owners tried and failed to make their dream a reality. Then one day the ‘Sold’ sign goes up again. And work begins. The paint job. Signage. Fitting out. Finally the stock arrives. And then, having spent a small fortune on their dream shop, they have The Grand Opening. And a few months later new signs go up: Grand Closing Down Sale – Everything must go! A wonderful ability to decide they know what potential customers want – rather than trying to find out what the customers actually want. What’s this got to do with your job interview…? Many people attend job interviews or on-job appraisals with the same starry-eyed optimism as these would-be shop-keepers. They, too, have done little research and they don’t have a plan of action for the interview. Result? They see-saw between nervousness and starry-eyed optimism as interview day approaches. I’m the ideal person for the job. I hope I don’t sweat too much! Won’t it be great when I have this job! In an interview your role is to sell – not just answer questions. And to do this effectively you must research your potential ‘customer’. Remember that your interviewer is a human being. They are more interested in their WIIFMs, their ‘what’s in it for me’, more than in us. Strange as it may seem the interviewer is thinking about... the interviewer’s career. I once managed an employment agency in Central London and, as part of my job, would interview many people seeking jobs each week - and many who were looking for candidates. The interviewer wants to find the best fit for the job – because if the new hire does a good job in reflects well on the interviewer; their career is enhanced! This means that if you come across as the best fit, because you are a good fit for the job, and because you sell yourself well, you make their day. So, let’s assume that you are a very good fit, otherwise why apply for the post, and that you maintain this as an unwavering belief. Unwavering. Next you must sell yourself well. Yes, remember that the interview is a sales process. You are selling a product: yourself. You must influence the interviewer to ‘buy’ you – as the best fit. A majority of sales people talk too much – avoid this mistake. Everyone likes to buy things – but nobody likes to be sold things. We to walk into a shop and select what we decide is right for us – what we feel will match our needs. And being pounced upon by a gabby salesperson who tells us why something is right for us gets most of us heading for the exit. Expert sales people do it differently and more subtly: they get to know a little about you and your needs and then they assist you in finding a best fit for your needs. They are selling conversationally. 3. Help you find what will match your needs. What’s it like to be them? How has their day been so far? Are they looking forward to their lunch – or recovering from it? Are they excited about the candidates they have seen so far – or despondent? Have previous interviewees shown a genuine interest in the interviewer? (You can do some of this overtly – and some will be done by reading between the lines). It’s unlikely you can do this in detail. But you can gauge a lot from how they introduce themselves. And you can ask some questions. You already know that they want to find the best candidate because this will enhance their reputation. So, from their viewpoint, will ‘buying’ you advance their career or be a threat to it? Do they like to play safe or take a flyer? When you get the job (!) will they be directly in contact with you or are they from HR and doing the interviewing for somebody else? You can also learn a lot about the organisation in advance. And being able to demonstrate this will not only impress the interviewer – it will reassure them about your skill and your thoroughness. To do this you need to get some information from them in order to sell yourself proactively. 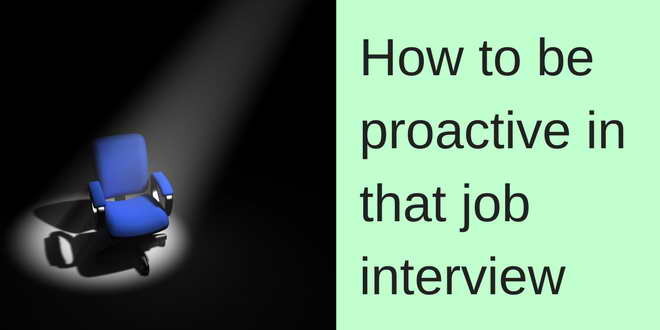 Many see interviews as a passive process: they walk in, sit down, state their case, get asked questions and, in their answers, attempt to give them as much information as possible. In short, the interviewer provides information – the interviewee decides its value. Wrong attitude: especially for all but the most junior posts. … show them how hiring you will be in their interests. Prepare your product: what have you got that they need? Packaging: the most appropriate way to dress and act for the interview. Sales facts & figures: your experience – and track record. Reasons for them to buy you: – how your personality will fit. Decide in advance what you want them to know i.e. your 3-4 key selling points (with factual examples & evidence for each). What exactly is your objective for this interview? Except for unskilled jobs, there will usually be at least two interviews. So, be clear what you need to achieve in each interview e.g. Evoke their curiosity in what you haven’t had time to tell or demonstrate. Position yourself as not being one of the crowd. Be proactive – and make sure you are in rapport with them at the outset, otherwise your proactivity may not fit their personal style and expectations. Answer questions enthusiastically and always support your answer with evidence and specific examples from your experience. Continually give them reasons to ‘buy’ you. Impress with your thoroughness and your thinking so that you convince them that hiring you will benefit their own career. And remember, this approach can make your in-job appraisal interviews more productive for you and more comfortable for both parties.